"Delicious and warm. 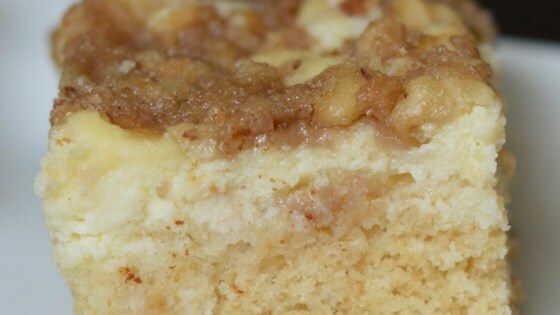 Wake up and smell the coffee cake. I love this recipe, although it is a bit time-consuming." Beat 1 cup white sugar, 1/2 cup butter, and 1 egg in a bowl until smooth. Add sour cream and vanilla extract; mix well. Stir in 3 cups flour, baking soda, and baking powder until mixture comes together in a sticky dough. Spread half the dough evenly into prepared baking dish. This recipe wasn't as great as I hoped it would be. My bf liked it but I won't make it again... I've made other versions I liked much more. Thanks anyway. Maybe it just wasn't my cup of tea?